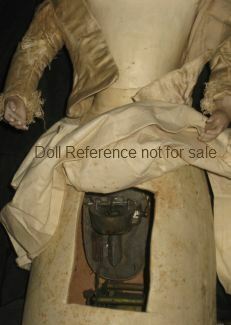 Antique Mechanical dolls are referenced as early as the mid 17th century, with the golden years being roughly 1850 to the early 1900s. Antique Automata dolls or Mechanical dolls are dolls that moved, usually through a clock work like mechanism, the dolls were made by Americans, French and Germans. Some types of mechanical dolls are: Automatrons; dolls that played a musical instrument, Animated dolls, Autoperipatetikos dolls, Cymbaler dolls, Gigoteur dolls that cry, kick, walk or talk. Musical Marottes; a doll head on a stick atop a music box, Ondine swimming dolls. Dolls with Pull Toys, Phonograph dolls, Creeping, Walking, Talking, Kiss throwing dolls and Waltzing dolls, are some of the early movable, magical and innovative dolls that have amused adults and children. Patented July 15th, 1862: also, in Europe, 20 Dec. 1862. Distributed by Daniel S. Cohen and Joseph Lyon & Co. of New York City, Martin & Runyon of London, plus others. Created in 1772 by Pierre Kintzing a watch maker and David Roentgen a cabinet maker. Purchased by Queen Marie Antoinette of France in 1785, restored in 1864 by Jean Eugene Roubert-Houdin and now resides in the Musée des Arts et Métiers. Automata Mechanical Dolls; Dehais, Fischer, Naumann & Company, Fleischmann & Bloedel (or Blödel), Adolph Fleischmann & Cramer, Arthur Heinze, I M Helvetic Corp. also called H & M Corp., Ives, Blakeslee & Co, Pierre Jaquet-Droz, Léopold Lambert & Eugénie Bourgeois, Henri Maillardet, Ferdinand Martin, Jean-Marie & son Edouard Henri Phalibois, Louis-Marie Renou, Friedrich Adolph Richter, Charles Rossignol, Roullet et Decamps, Jean Rousselot, SFBJ, Schoenau & Hoffmeister, Alfred Schroeder, Max Schudze, Alexandre Nicholas Théroude, Gustave Vichy, Ungarische, VanHollbeke, Jaques de Vaucanson, plus others. 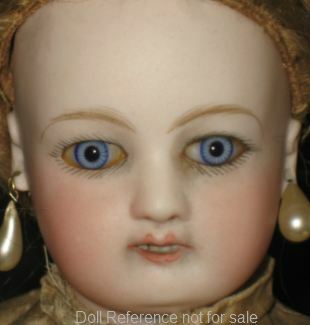 Doll heads are marked by the maker they were obtained from, other marks maybe on the keys, the mechanical device or have a paper label from the doll maker or store that sold the doll.. Animated dolls; Adolf Zinner, Gottlieb Zinner Cymbalier dolls made by Simpson-Crawford Company. Musical dolls; Heinrich Schellhorn dolls that sound like a xylophone, William A. Webber; The Webber Doll, Zeuch & Lausmann. Phonograph Dolls; Max Oscar Arnold, Madame Hendren Dolly Record, Emile Berliner gramophone talking dolls, Thomas A. Edison phonograph doll, Giebeler-Falk Doll Corp Primadonna a phonograph doll, Jenny Lind Doll Company phonograph doll, Bébé Phonographe Jumeau, Metal Devices Corp. phonograph doll, J. L. Schilling talking doll; patent by Jesse J. Warner & Son a wind-up talking phonograph doll. 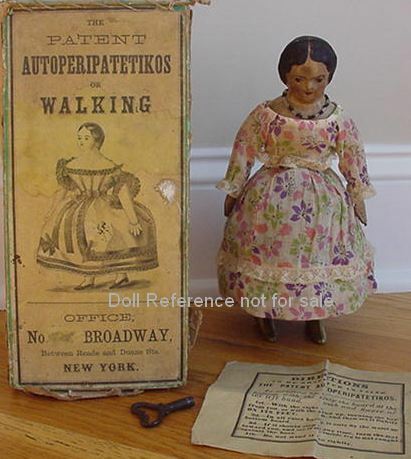 American Toy Co, Babs Manufacturing or Harry S. Coleman, Robert Clay or George Clark, L. Cohen & Son, William Farr Goodwin, Ferdinand Imhof, Irwin & Company, Japan, Ernst Paul Lehmann, Limoges, Johannes Maelzel, Armand Marseille, Louis Marx, Francis Pelobet walking dolls, Rabery & Delphieu, Sayco, Schoenhut, Johann Siedar, Simon & Halbig, Steevan's, Transogram, UNIS, Wood Toy, Bernard Zehner, plus others.